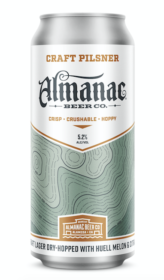 Almanac Craft Pilsner is an American beer, it has an alcohol content of 5.2%. We’ve updated our recipe book and put a West Coast spin on a favorite standby. This crisp, dry-hopped lager now features California grown pilsner malt from our neighbors at Admiral Maltings and hops that unleash irresistible sunny citrus aromas in every sip. According to our brewers, it’s the most fun beer to brew and tastes like sprite and saltines. Pairs well with watching the game, going for a hike and taking a break.